Plant a tree in memory of Dorothea "Dottie"
Be the first to share your favorite memory, photo or story of Dorothea "Dottie". This memorial page is dedicated for family, friends and future generations to celebrate the life of their loved one. 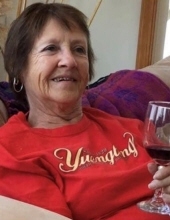 Dorothea “Dottie” Daubert, 73, of Summit Hill, PA, passed away on Wednesday March 13, 2019 at Lehigh Valley Hospital Cedar Crest. She was the wife of Robert W. Daubert with whom she would have celebrated 42 years of marriage this year. Born in Bethlehem, she was the daughter of the late Leo and Dorothy (Stednitz) Seier. Dottie was employed as a garment inspector for the former Tama Mfg. in Northampton for many years before retiring. She loved to run and was a member of the “Social Butterflies”, a running group dedicated to raising money for cancer research. She shared her life with her soulmate, traveling all over and visiting friends. She was an extraordinary woman who fought courageously through many health battles, always with a smile, and she lived each moment to its fullest. Surviving with her husband are sons Scott, Jeffrey Long and his wife Heather, and Thomas Daubert, daughters Melissa Lynn, wife of Dennis Snyder, Brenda Jane, wife of Scott Bandel, and Jennifer Jill Wandler, brothers Leo and John and his wife Kathi, 13 grandchildren, 5 great grandchildren, nieces and nephews. Services will be held at 1:30pm on Monday March 18, 2019 at Jordan U.C.C. 1837 Church Rd. Allentown, PA 18104. Calling hours will be 12:30-1:30pm Monday at the church. Memorial donations may be made to the American Cancer Society 3893 Adler Pl. #170 Bethlehem, PA 18017. To plant a tree in memory of Dorothea "Dottie" Daubert, please visit our Tribute Store. "Email Address" would like to share the life celebration of Dorothea "Dottie" Daubert. Click on the "link" to go to share a favorite memory or leave a condolence message for the family.